"It's a kid's story, lots of effects. It's Lord of the Rings-Lite." Did some studio executive somewhere get their paycheck based on the number of letters in the title? Why would someone name a film with a title this long? The Masked Reviewer has written research papers in school that were shorter than the subtitle alone! Presumably, "Chronicles of Narnia" was added to "The Lion, the Witch, and the Wardrobe" for branding purposes. When the sequels come out (and mark the Masked Reviewer's words, they will! ), they didn't want audiences to get lost wondering if it was the same franchise. "The Horse and His Boy?" "The Silver Chair?" "A Wet Shoe with Cabbage?" Are they all in the same series? Who knows? The marketing people could have at least come up with a decent acronym for the movie. CoN:tLtWatW isn't particularly catchy either. Hey! Want to see how it's done? The Masked Reviewer's whole review in fewer words than the title of the movie: "eh, it's okay if you like that kind of thing." Let's start with the Big Controversy (not really that big or controversial). There have been reports that CoN:tLtWatW is a propaganda film that promotes Christianity. The Masked Reviewer read the book as a kid and didn't remember that. The Masked Reviewer watched the film and didn't see it, either. There are some elements lifted from the Christian belief structure, but...C.S. Lewis lifted almost every element of the story from somewhere. Minotaurs, Centaurs, griffins (not Kathy Griffins, fortunately), Fawns, and even Santa Claus (!?) appear in the story. It's your typical "kids get involved in an epic adventure" kind of tale, like you'd see in Harry Potter. It's Lord of the Rings with kids. But, there isn't much in the way of true originality. As a kid, you might not know any better (for all you knew, C.S. Lewis could've come up with the idea of a talking animal!) but now, the whole movie feels like you're watching a weird Vegas tribute show to mythology. "And now...from the briny deep, the Mermaid! The Mermaid, ladies and gentleman!" This won't be too much of a spoiler, but you should skip this paragraph if you want to go in with absolutely no chance of anything being ruined for you. Oh, wait...actually, you probably should skip the preceding paragraph too...the Masked Reviewer did just tip that Minotaurs, Mermaids, Grifins, and Santa Claus appeared. So, don't read the previous paragraph. Anyway, the big event that has people convinced this is a pro-Christian movie is that one character is resurrected. A character dies (to help others) and comes back to life. So, people assume it's a Christ figure. Now, the same thing happened in Lord of the Rings...the wizard dies and comes back. He was even Jesus-like in appearance...but no one made a stink about that. Sure, there are other elements of Christian symbology -- a lion, a sword, healing stuff...yadda yadda yadda. The Masked Reviewer didn't see it. It's not that clever. In fact, if this is pro-Christian, the Christian PR people should be fired. Santa gives little children weapons. They fight. It's bloody and violent. This isn't all about peace and love...it's about...talking animals fighting each other. Sure, there are references to the humans as "sons of Adam" and "daughters of Eve", but the Masked Reviewer kind of thought it was a bit anti-religious. The Christian stuff is put on the same level as Santa Claus and Roman mythological characters. Granted, C.S. Lewis was a Christian (converted by none other than Lord of the Ringscreator, J.R. Tolkein), but there doesn't seem to be much deep though or symbolism in CoN:tLtWatW. By the way, if you haven't seen Lord of the Rings, you might not want to read that previous paragraph either, as it contains a big spoiler about that film too. Huh. 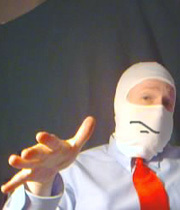 Well, if you haven't seen it by now, it's not the Masked Reviewer's fault. On to the special effects. They're good! In fact, they're quite good. The basic trouble is that computer graphics (CG) isn't quite there yet. The Masked Reviewer believes that it's good and gets better all the time, but people still recognize CG as CG. People say "Oooh, that's a great CG cow," not "that's a cow!" The film has a number of animals as stars, and while they look better than anything you've seen (check out the lion's fur, for example), it still looks like CG. Nonetheless, the visual effects are of equivalent quality to what you'll find in Lord of the Rings. Massive battles are visually interesting. They're not particularly interesting otherwise, but visualy...you betcha. Is it worth seeing just for the visuals? Not really. There's nothing new in the movie. Where else will you see a digitally created beaver? The acting is fine. The young actors (the youngest girl and younger boy, in particular) do a fine job in fairly beefy roles. Often young actors can't carry a whole movie, and despite the nearly continuous presence of special effects, the humans have a lot of screen time to carry. The older brother and older sister aren't quite as good, but they're not distractingly bad. Although, whenever the oldest boy holds a sword, he looks just plain silly. He's supposed to be a fearless leader and...he looks like he's about to fall over. Get that man a plastic sword! The plot, as previously mentioned, is a mish-mosh. It's standard fantasy. In every way. Those unfamiliar with C.S. Lewis who see CoN:tLtWatW might just think it's all a rip off. It kind of is. The characters aren't particularly compelling. This was true of Lord of the Rings, but at least here it's a kid's story, so it's somewhat forgivable (what do kids need a plot for anyway?). There are some strange questions. People spend a fair amount of time running and hiding from bad guys in the snow. These bad guys can't seem to figure out that there are tracks in the snow. Another oddity. The humans arrive in the strange titular world of Narnia and get embroiled in local politics. They choose sides. How do they know they're on the right side? Something to think about. One character who dies evokes a tearful emotional moment, but that character only knew the other characters for about thirty seconds of screen time. How worked up are we supposed to get over someone we just met kicking the bucket? It's the Dorf Principle. You have to spend some time listening to Dorf and getting to know him before seeing him get hit in the groin with a golf ball is funny. You remember Dorf, right? Dorf on Golf? Tim Conway walking on his knees? He should've played the dwarf in this movie. Okay, that's enough about CoN:tLtWatW . It's not un-entertaining...it's fine. It's not worthy of any big controversy. It's a kid's story, lots of effects. It's Lord of the Rings-Lite. Huge fans of C.S. Lewis will be sure to like it, and despite some rather scary cat-scares (and a wolf-scare), it didn't appear to be too much for any of the kids in the audience. Expectation from the Title: It's hard to form an expectation from the title when it's so long that you fall asleep half way through reading it. Mother's Rule (Always Say Something Good About Everything): That lion is so fluffy and cute...it's a big kitty! The Pros: Good effects, child actors are fine. The Cons: Everything has been done before. It doesn't feel like there's a moment of creativity. Sure, we may have seen some things before because movies lifted from C.S. Lewis'ss's books, but it's hard to give him the credit when Santa Claus and others are making cameo appearances.